NEW CHAT--MUMS THE WORD OVER THE BACKYARD FENCE HAS STARTED. USING CAPS FOR VISUALLY IMPAIRED FRIEND TILL SURGERY! Team leader for Empty Nesters and the Gardening Team. WHERE HAS THE YEAR GONE? IT'S SEPTEMBER ALREADY? CAN'T WAIT FOR THE COOLER TEMPS THOUGH. START BY THE DOING WHAT'S NECESSARY, THEN WHAT'S POSSIBLE, AND SUDDENLY YOU ARE DOING THE IMPOSSIBLE. NICE START TO THE DAY BUT THEN TO WE ARE TO GET WARMER AND THE HUMIDITY WILL RETURN TOO. NO LECATES I ONLY HAVE LOCAL CALLS ON MY PHONE AND QUITE FRANKLY I ONLY USE IT IF I AM SHOPPING AND LOSE MY DAUGHTER OR GRANDDAUGHTER, OR I WILL USE IT FOR EMERGENCY LIKE GOD FORBID I WOULD FALL OR WHATEVER WHEN I AM OUT ALONE. EVELYN, GLAD YOU ENJOYED HAVING SOME QUIET ALONE TIME. HOW IS THE KITCHEN COMING ALONG? NANCY, CAN'T YOU GET THOSE PHONE CALLS ON YOUR CELL PHONE OR HAVE THEM CALL YOUR DD FOR YOU? TOO BAD YOU CAN'T GO AWAY FOR THAT SHORT A TIME. WE DID GET A FEW SMALL PROJECTS DONE OUTSIDE YESTERDAY---DOUBT ANYTHING OUTSIDE WILL BE DONE THIS WEEK AS THE HEAT AND HUMIDITY COMES BACK STARTING TODAY. IT IS NICE THIS MORNING BUT WILL HEAT UP QUICKLY---THE CATS ARE ENJOYING ONE MORE MORNING ON THE FRONT PORCH.. I DID HAVE A GOOD VISIT WITH MY SISTER AND NOW SHE IS TRYING TO GET ME TO GO OUT OF TOWN TO VISIT MY OTHER SISTERS FOR 4 DAYS, I WOULD LOVE TO GO BUT WITH ALL THE APPOINTMENTS AND WAITING FOR PHONE CALLS FOR APPOINTMENTS, I CAN'T.. ONE SISTER REALIZES WHAT I MEAN BUT THE ONE THAT LIVES CLOSEBY DOESN'T.. BESIDES THAT I HAVE ANIMALS TO THINK ABOUT. NANCY, HOPE YOU HAD A GOOD VISIT. YESTERDAY WAS LOVELY HERE---EVEN CAME HOME TO DH STILL HAVING THE FRONT DOOR OPEN---THE CATS ENJOYED THE PORCH---I TRIED TO SIT OUT THERE YESTERDAY EVENING BUT OUR NEW NEIGHBORS HAVE KIDS AND THEY PLAY OUT FRONT NEAR THE STREET AND WERE RUNNING AFTER A BALL WITHOUT LOOKING--THE PARENTS WOULD YELL AT THEM BUT THEN IGNORE THE FACT THAT THEY WERE STILL ON THE STREET. I FINALLY GOT TIRED OF THE NOISE AND WENT BACK INSIDE. I HOPE THE KIDS ARE NOT HERE TONIGHT AS IT APPEARS LIKE IT WILL BE A REPEAT OF YESTERDAY'S WEATHER. YESTERDAY WAS BORING AND TODAY WILL BE A REPEAT--BUT THAT IS NORMAL. I DID FIND OUT ABOUT THE MASTER GARDENER CLASS---$165 TO TAKE IT---GOING TO GO DOWN AND SEE IF i CAN GET THE SCHOOL SYSTEM TO PAY FOR IT---I REALLY WOULD LIKE TO TAKE IT BUT NOT SURE IF I SHOULD SPEND THAT KIND OF MONEY RIGHT NOW IF THEY DON'T---I WILL HAVE TO TALK IT OVER WITH DH WHEN I GET HOME TONIGHT TO SEE WHAT HE SAYS IF THE SCHOOL WON'T PAY FOR IT. I CAN GET MY VOLUNTEER HOURS IN HERE AT THE SCHOOL SO IT WILL DEFINITELY BENEFIT THEM. COVEGIRL WHAT WILL YOU BE DOING? i will be volunteering in the Native garden at a local church, today! NANCY, SHE DID THE SAME THING HER DADDY DID AT ONE TIME---SHE BENT HER BONE WHEN SHE FELL---CALLED A GREEN BRANCH BREAK WHEN HE DID IT---SHE IS FINE NOW---SHE FELL TRYING TO DO THE MONKEY BARS---THANKFULLY WHEN HER DADDY WAS WITH HER AND NOT ME. LOVELY WEATHER AND I HAVE TO GO BACK TO WORK TODAY---SIGH--OH, WELL, ENJOYING THE NICE COOL TEMPS THIS MORNING WITH THE DOOR OPEN. I DID PULL SOME WEEDS AFTER REAGANN LEFT YESTERDAY---WE HAD HER TIL ABOUT 2 SO IT WAS A NICE TIME TOGETHER. THEN WE WENT OUT FOR PIZZA AFTER WATER AEROBICS WITH MY WATER PARTNER AND HER DH. nEED TO SIGN OFF AND LEAVE FOR WORK! I HEARD BRIEFLY FROM JOJO TOO.. POOR HER SHE ALWAYS SEEMS TO HAVE ONE THING OR ANOTHER GO WRONG. LECATES, WHAT DID I MISS? WHAT HAPPENED TO YOUR GD THAT SHE HAD TO HAVE A CAST? The weather is cool here in Indy. I volunteered in a garden this morning. It was very pleasant. I did a bunch of deadheading, so it gives me time to think about things. CRUZ, GLAD YOU ARE GETTING A FREE CARTON. I HAD AN ISSUE WITH A BOX OF CORN FLAKES IN JULY AND THEY DID THE SAME FOR ME---SENT ME A COUPON FOR A FREE BOX----THINGS HAPPEN. THAT IS MISERABLE WEATHER---I HATE HUMIDITY--FEELS LIKE YOU ARE WALKING INTO A STICKY SPIDER WEB. EVELYN, ONCE THE REMODEL IS OVER, YOU WILL BE VERY HAPPY---HOPE YOU ARE TAKING PICTURES AS IT GOES ALONG. I DID GET THE LAWN MOWED LAST NIGHT---IT WAS THICK, TOO. TODAY IS MY LAST DAY OF SUMMER BREAK. WATCHING MY GD THIS MORNING---HOPING SHE WANTS TO COME BACK HERE TO DO SOME CRAFT STUFF OR WANTS TO GO SOMEWHERE AS A TREAT FOR BACK TO SCHOOL TIME. SHE GOT HER CAST OFF ON MONDAY SO SHE IS GOOD TO GO MOST PLACES. GOT AN EMAIL FROM JOJO---SHE HAS FALLEN AND BROKEN HER RIGHT ARM---PLEASE KEEP HER IN YOUR PRAYERS AND THOUGHTS. SHE IS GOING THRU A ROUGH PATCH. LECATES - I'M NOT SURE WHAT HAPPENED TO THE ICE CREAM. MY FIRST THOUGHT WAS MAYBE THERE WAS A BUBBLE IN THE MACHINE AS IT POURED INTO THE CARTON BUT i ALSO WONDER IF IT MELTED AT ONE POINT AND REFROZE. ANYWAY, I HEARD BACK FROM DREYERS AND THEY ARE MAILING ME A COUPON FOR A FREE CARTON!! NANCY - I IMAGINE LONDON FOG FEELING A BIT COOLER. IT'S BEEN NASTY AROUND HERE LATELY....LIKE A STEAM ROOM. HOT, HUMID, AND KINDA FOGGY AS A RESULT. NANCY, THE HUMIDITY JUST MELTS ME---I FEEL LIKE A FROSTY THE SNOWMAN JUST MELTING INTO A PILE. YES, I AM READY TO GO BACK TO A ROUTINE---IT HAS BEEN A HORRID SUMMER. WELL, WE ARE NOW COVERED AGAIN FOR HEALTH INSURANCE---THAT TAKES A LOAD OFF MY MIND. BOY IS THE WEATHER EVER CHANGING FAST, IT WAS 59 AN HOUR AGO. IT IS NOW 71 AND WE ARE ONLY SUPPOSED TO BE ABOUT 75 BUT WITH THE HUMIDITY WE ARE GOING TO 84.. I THINK WE ALL HATE HUMIDITY---IT CAME BACK HERE YESTERDAY, TOO. WE DID GET ANOTHER STAGE OF OUR OUTDOOR PROJECT DONE EVEN THOUGH IT TURNED HOT QUICKLY---WE DID THE SECTION NEXT TO THE GRILL AREA---RAKED UP THE MULCH, LAID DOWN NEW LANDSCAPE FABRIC, AND THEN REMULCHED THAT AREA----THAT IS THE SECTION WITH MY GD'S PLAYTHING ON IT---THE REST OF THE PROJECT WILL BE DONE WHEN THE TEMPS ARE COOLER FOR SURE---WE NEED TO START GETTING STUFF CLEANED UP IN THOSE AREAS AND DH CAN DO THAT IN STAGES SO THAT WE CAN EITHER WORK ON IT WHEN I GET OFF OF WORK OR ON SATURDAYS---WE ARE PLEASED WITH WHAT WE HAVE GOTTEN DONE ALREADY. I DID BUY SOME MORE HENS AND CHICKS YESTERDAY WHEN I WAS AT LOWE'S---GOT THEM ON CLEARANCE SO NOW I HAVE TO FIGURE WHERE TO PUT THEM. AND NOW SHE HAS HER FIRST LOOSE TOOTH! IT WAS A SPECIAL DAY. SHE SEEMED TO ENJOY IT. I THINK SHE IS TIRED. I DID WELL. I THINK HER BEING EXCITED AND LOOKING FORWARD TO THIS DAY HELPED. SHE'S ALSO BEEN GOING TO MOTHER'S DAY OUT TWICE A WEEK SO I GUESS I'M SOMEWHAT USED TO IT. CRUZ, THANKS FOR SHARING THE PICTURES---A MONENTUOUS DAY FOR ALL OF YOU. THEY GROW UP SO QUICKLY. NANCY, IT TURNED HUMID HERE TODAY TOO----BUT WE HAD TO GET THE NEXT AREA DONE SO WE COULD RESPREAD THE MULCH WHEN IT WAS NOT WET---IT DOES LOOK GOOD BUT WE WILL DO THE NEXT HALF IN COOLER WEATHER, FOR SURE! FINALLY, THE PAPER WORK ARRIVED THAT I NEED TO GET US ON MY WORK INSURANCE---THIS HAS BEEN A NIGHTMARE DEALING WITH THIS ISSUE. I DID BUY A TRAY OF HENS AND CHICKS ON CLEARANCE WHEN WE STOPPED AT LOWE'S TODAY---NOW I NEED TO FIGURE OUT WHERE TO PLANT THEM. I spent 90 minutes in my yard today. It needed it. but I have a bed that needs some major work. 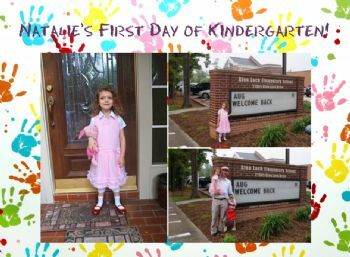 OUR MINI STARTED KINDERGARTEN TODAY! YES LECATES THE GROOMER IS ABOUT 2 1/2 BLOCKS AWAY AND THERE IS A LITTLE PARK WITH A BENCH SO WE USUALLY STOP THERE FOR A BIT,, WE MEANING ME AND KIRBY.. HE IS THERE NOW AND WILL BE DONE BY ABOUT NOON. I SHOULD HAVE SAT OUT ON THE PORCH MYSELF YESTERDAY---LOL---BUT I SPENT THE DAY ON THE COUCH RESTING MY BACK FROM THE SATURDAY PROJECT. NANCY, CAN YOU WALK TO THE DOG GROOMER'S? I GO BACK TO WORK ON THURSDAY---TODAY I TAKE MY CAR IN FOR AN OIL CHANGE AND WE MIGHT WORK ON ANOTHER PROJECT TODAY--NOT AS STRENUOUS---MOVING THE TODDLER CLIMBER AND CLEANING THAT AREA AND REMULCHING IT WITH THE MULCH WE MOVED FROM THE GRILL AREA. Lots of inside work today, but will at least manage a walk for fresh air. The only way to predict the future is to plan for it. TOMORROW I TAKE KIRBY FOR ANOTHER SHAVE, I THINK HE NEEDS IT MORE THAN ME BUT I WISH THE HAIRDRESSED NEXT DOOR TO THE GROOMERS WAS OPEN TOMORROW AS I WOULD DROP IN. You had a very busy day, Lecates. I will be volunteering in the demonstration garden at the state fair, today. This is the last day for the fair. I hope to get into my own garden this week. WELL, WE DID DO THE PROJECT YESTERDAY---MOVED THE GRILL AND CLEARED THE MULCH FROM THAT AREA, THEN LAID NEW LANDSCAPE FABRIC, THEN A LAYER OF PAVING MATERIAL AND LAID OUT 25 PAVERS FOR DH'S GRILL TO SIT ON--IT LOOKS REALLY NICE BUT IT WAS A LOT OF WORK. ONE OF THE 3 TRIPS I MADE TO LOWE'S, FOUND SOME NEW CHAIR CUSHIONS ON CLEARANCE FOR THE DECK--LESS THAN $9 EACH AND 2 PILLOWS FOR THE FRONT PORCH FOR $7 ---SO IT WAS A GOOD BUT VERY TIRING DAY---TODAY WE WILL ENJOY THE CUSHIONS AND THE NEW GRILL AREA. iT IS NICE AND COOL HERE THIS MORNING SO HAVE THE FRONT DOOR OPEN---THE CATS HEADED OUT TO THE PORCH AS SOON AS I OPENED IT---SURE WISH THIS LOW HUMIDITY WOULD STAY---BUT WILL ENJOY THE DAYS THAT WE HAVE IT--I KNOW HOT WEATHER WILL COME BACK. NANCY, I HAVE SEEN MY MOM GET THAT ATTITUDE---AND WITH ALL THE APPOINTMENTS THIS SUMMER, I COULD TOTALLY UNDERSTAND IT. IT WAS DAUNTING AND TIRING AND SUCH A PIA. BUT HANG IN THERE, GF! WE ARE SUPPOSED TO HAVE LOW HUMIDITY THIS WEEKEND---WE DO HAVE AN OUTDOOR PROJECT WE MIGHT WORK ON TODAY. THE HOSPITAL CALLED YESTERDAY AND I HAVE TO GO FOR THE BIOPSY ON MY THROID GLAND ON SEPT.2nd.. IT WAS SUPPOSED TO BE DONE THE SAME TIME AS THE ULTRA SOUND WAS BUT LORD AND BEHOLD THAT WOULD HAVE BEEN OVER AND DONE WITH,, BUT NO SO HERE I GO AGAIN,, DO YOU EVER GET TO THE POINT THAT YOU WANT YO SAY "TO HELL WITH IT ALL?" NANCY, I REMEMBER MY DH DOING THAT AFTER HIS SHOULDER SURGERY. HOPE IT HELPS---AND GOOD THAT YOU CAN GO WHERE IT IS FREE. I DID GET OUT AND ENJOY A TRIP YESTERDAY---WE DROVE DOWN TO VIRGINIA TO PICK UP A GREAT DEAL ON A BOX OF STEAKS, THEN WENT TO CHINCOTEAGUE TO THE ISLAND CREAMERY TO GET THEIR DELICIOUS ICE CREAM---MY FAV IS THE MARSH MUD---REALLY DARK CHOCOLATE---AND DH GOT BANANA CARUMBA. WE DID HIT RAIN ON THE WAY HOME OFF AN ON---SOME VERY HEAVY AT TIMES BUT AT LEAST WE GOT OUT OF THE HOUSE FOR A WHILE. NANCY, WILL IT BE AN ISSUE TO GO BACK TO THAT PLACE TO DO THE PHYSIO? SURE HOPE NOT. PT IS EXPENSIVE WITHOUT INSURANCE---AND EVEN WHEN COVERED WITH COPAY, IT ADDS UP QUICKLY. GLAD YOU FINALLY GOT AN ANSWER BUT SURPRISED THAT THEY CAN'T DO ANYTHING ABOUT IT. SURE HOPE THE SHOT HELPS BUT THAT IS RIDICULOUS THAT YOU HAVE TO WAIT THAT LONG FOR IT. CRUZ, NICE TO HEAR FROM YOU. PAULAJEAN---GLAD IT WORKED OUT FOR YOU. MORE ISSUES WITH GETTING INFO FROM THE STUPID HEALTH INSURANCE SO I CAN START INSURANCE AT MY JOB----GRRRRR---FINALLY GOT DH TO CALL THE UNION AND NOW THEY ARE INVOLVED, TOO. HOPING THAT WILL SPEED THINGS UP A BIT. GETTING SOME RAIN HERE TODAY---NEED IT! NANCY - SORRY TO HEAR ABOUT THE SHOULDER BUT GLAD TO SEE THE GOOD NEWS ABOUT IT. WOW, 91! AND HUMIDITY! THAT'S IMPRESSIVE! NO GREAT SURPRISE. I HAVE A TORN TENDON AND ANOTHER JUST ABOUT THERE, MY SHOULDER HAS STARTED TO FREEZE SO PHYSIO HAS TO BE DONE, BEFORE THAT I HAVE TO HAVE ANOTHER INJECTION , NOW IT IS IN THE SHOULDER BUT DON'T ASK ME INBETWEEN WHAT JOINTS CAUSE I DON'T KNOW,, I WENT TO GET THE APPOINTMENT FOR THE ULTRASOUND/INJECTION AND THERE IS NOTHING BEFORE SEPTEMBER 29th, THAT'S RIGHT SEPTEMBER 29TH.. THANKS FOR ASKING, LECATES. I WANTED TO GO BACK TO COLLEGE & GO INTO THE FINANCE/BUSINESS WORLD. SO GLAD I DID BECAUSE IT LED ME TO WONDERFUL JOB FOR ME. PAULAJEAN, WHY DIDN'T YOU ASK TO BE TRANSFERRED BACK TO THE HIGH SCHOOL AGE? COVEGIRL, I AGREE---MIDDLE SCHOOL IS THE PITS! NANCY, GLAD YOU LOVE YOUR NEW CURTAINS. DO YOU GO TO THE SPECIALIST TODAY? WE MIGHT GET RAIN HERE TODAY---HOPE SO! HAVE A GOOD WEDNESDAY! Right now, I am having garden withdrawal. I have not done anything in my yard for about a week. I worked at the tomato juice stand at the state fair, today! Paula Jean,I was a special education teacher for many years. I did my student teaching in junior high school, and I did not like it. I worked in elementary and high school. I loved being at a high school. I PREFERED HIGH SCHOOL TOO. LECATES. IT WAS THE ELEMENTARY GRADE LEVEL THAT BURNT ME OUT & LED ME TO A CHANGE OF CAREERS. I'M APPRECIATING THIS RAINY DAY TODAY....OUR AREA NEEDS IT. NANCY, HOPE HE DOES AND FIGURES OUT WHAT TO DO TO HELP YOU. NO FUN HAVING THAT PAIN AND NOT BEING ABLE TO DO THINGS YOU LIKE TO DO. PAULA JEAN, THIS IS MY 9TH YEAR--I WAS A SUBSTITUTE TEACHER FOR 23 YEARS BEFORE THIS---LIKED DOING THAT AS I LIKE VARIETY BUT NEEDED BENEFITS FOR RETIREMENT. WHAT GRADE LEVEL DID YOU WORK WITH? I LIKE WORKING WITH THE HIGH SCHOOL STUDENTS---I DON'T THINK I WOULD LIKE WORKING WITH YOUNGER KIDS. EVELYN, GLAD YOU ENJOYED YOUR SOUP. NOT SURE WHAT I WILL GET INTO TODAY---PRETTY MUCH GOT THE SPARE ROOM CLEARED OUT---DO NEED TO GO REMAKE THE BED IN THERE---BUT OTHERWISE I AM ALL CAUGHT UP. MIGHT JUST GO TO HOBBY LOBBY TODAY AND WANDER FOR A WHILE. NANCY, I'VE BEEN NOTICING HOW HOT THE WEATHER HAS BEEN IN YOUR AREA. YOU'RE EXPERIENCING THE SAME KIND OF HEAT AS MY AREA DOES....ONLY WE'RE USED TO IT HERE IN IOWA. LECATES, I USED TO BE A SPECIAL ED ASSISTANT! I WAS ONE FOR ABOUT 7-1/2 YEARS BEFORE GOING BACK TO COLLEGE AND BECOMING A BILLING SPECIALIST. I INFORMALLY RETIRED IN 2011 BECAUSE OF MY HEALTH. ANOTHER HOT ONE TODAY, LIKE YESTERDAY WITH THE HUMIDITY IT WILL BE OVER THE HUNDRED MARK AGAIN. Kris, I GO BACK TO WORK ON THE 27TH BUT THE TEACHERS GO BACK THE 24TH---I AM A SPECIAL ED ASSISTANT AND HAVE A ONE-ON-ONE STUDENT---THIS IS HIS SENIOR YEAR. GLAD YOU FOUND THE CHAT. I MADE CHILI YESTERDAY IN THE CROCK POT WITH OUR FIRST GREEN PEPPER. MIGHT GET A FEW MORE BUT ONLY ONE OTHER IS NEAR TO BEING PICKED. TOMATOES HAVE SLOWED DOWN A BIT BUT WE HAVE ENOUGH TO EAT UNTIL THE REST TURN COLOR. FLOWERS ARE DOING LOVELY. HAVE EVERYONE HAS A GOOD MONDAY! Evelyn, how was your squash soup? Did you have it cold or hot? Is it a Spark recipe? Sounds like this hot and humid weather is all over the northern hemisphere! Walking out into it is like penetrating a wall of water. It's supposed to break tomorrow here (MN), so I hope I can finish some chores before I have to go back to teaching in a couple of weeks. On days like these, it's easy to get my 8 glasses of liquids. ITS HOT AND HUMID BY ME. STILL AT THE OLD HOUSE LOOKING FOR WORK, ALTHOUGH I AM GETTING TO THE POINT WHERE I JUST WANT TO FIND A NEW JOB ASAP SO I CAN GET EVERYTHING MOVED TO THE NEW PLACE. I DONT LIKE HAVING TO STOCK AND MAINTAIN 2 HOUSES. MOSTLY IT WILL MAKE SHOWINGS REALLY EASY IFI AM NOT HERE. It is harvest time for my garlic. We planted over 90 cloves last September and now it is time. They look beautiful and big - Heirloom garlic. NANCY, HOPE THE SPECIALIST CAN GIVE YOU SOME RELIEF. HOT AND HUMID IS OUR FORECAST, TOO. EVELYN, GOOD CHOICE IN NAMES FOR A KITCHEN COLOR--LOL---I HOPE THINGS GO SMOOTHLY---LOOKING FORWARD TO SEEING PICTURES. ARE YOU TAKING BEFORE AND AFTER ONES FOR US? NANCY, HOPE YOU HAD NICE RAIN. HOT AND HUMID FOR TODAY---BUT THAT'S OKAY--MOST OF THE OUTSIDE WORK IS DONE---DH WEED WHACKED YESTERDAY. ENJOYED LAST NIGHT WITHOUT MY MOM----LOL---IT WAS SO NICE TO BE ABLE TO STRETCH OUT ON THE COUCH WHEN I FELT LIKE IT. WE HAD A REALLY NICE DAY OUTSIDE YESTERDAY---GOT THE LAWN MOWED AND IT WAS A WORKOUT AS IT WAS THICK BECAUSE IT HAD RAINED FOR SEVERAL DAYS. ANOTHER LOVELY DAY HERE AND THEN THE HUMIDITY RETURNS. MY MOM WANTS TO MOVE BACK HOME TODAY AS FOOTBALL STARTS ON TV NOW AND WE DON'T WATCH IT HERE---SO THAT IS MY PLAN FOR TODAY. We could use a little rain. we have one of our granddaughters today. I won't be gardening. I twas a beautiful day and my volunteer work in the garden went well! DEFINITELY NEED TO MOW THE LAWN TODAY---AND MOM SAYS SHE WANTS TO MOVE BACK HOME TOMORROW BECAUSE FOOTBALL STARTS ON SATURDAY AND WE JUST DON'T WATCH SPORTS AT MY HOUSE---SO WILL TAKE HER HOME. GOOD IDEA TO BLOCK HER NUMBER, NANCY. SAD WHEN A PERSON GETS TO THAT STAGE. COVEGIRL, HOPE IT IS AS NICE AS IT IS HERE THIS MORNING FOR YOUR VOLUNTEER WORK. LOVELY START TO THE DAY---SHUT OFF THE AC AND OPENED THE FRONT DOOR---THE CATS ARE HAPPY TO BE OUT ON THE PORCH THIS MORNING. HAVE MY GD THIS MORNING---PLAN ON DOING A SHOPPING TRIP WITH HER---WE HAVE HARDLY SEEN HER THIS SUMMER WITH ALL OUR DOCTOR VISITS SO I WANT TO SPOIL HER A BIT TODAY. I will be volunteering in a garden today, but I am staying for only one hour! I don't need a repeat from yesterday. so sorry to hear that Nancy! We have that problem with community gardens here, too. Today was a much cooler day with lower humidity. I volunteered for an hour this morning with my master gardeners, and then 2 hours in my own garden. I remember when I could spend up to 6 hours gardening. I thin those days are gone. I'm pooped! NANCY, TIME TO TALK TO HER FAMILY ABOUT THE PHONE CALLS---IS SHE STILL LIVING AT HOME ALONE? SURE HOPE NOT---BUT IF STAYING WITH FAMILY, THEY SHOULD TAKE THE PHONE AWAY FROM HER AT NIGHT OR AT LEAST TAKE THE BATTERY OUT SO SHE CAN'T USE IT. WE GOT MAJOR RAIN YESTERDAY---IN THE MORNING AND THEN LAST NIGHT---EVEN MAJOR BOOMERS WITH LAST NIGHT'S STORMS---BUT LOW HUMIDITY FOR A COUPLE OF DAYS SO THAT IS NICE. IT HAS BEEN NICE NOT HAVING TO WATER EVERYTHING THIS SUMMER. Good PICTURES, COVEGIRL. THANKS FOR SHARING. HOPE YOU HAVE FUN AT THE FAIR. NANCY, HOPE THE ARM IS BETTER TODAY. LOTS OF RAIN THIS MORNING AND OF COURSE, I HAVE TO GO OUT IN IT TO TAKE DH TO LAST DIABETES CLASS. WE HAVE LEARNED SOME VERY USEFUL THINGS AT THE CLASS. Thanks so much, Nancy. Today I will be working at the Indiana State Fair at the tomato juice stand. It is manned by master gardeners. Profits will go to funding of community gardens. Here are two pictures from the Sky Farm at Eskenazi Hospital in Indianapolis. I don't know how to share the pictures I took of the Sky farm. I took them on my phone, but when I tried to save them to my computer, they don't com up as a jpg. If I figure it out, I will post them. HOPE THE ARM BEHAVED, NANCY. HAD A BIT MORE RAIN TODAY SO NO LAWN MOWING---HEADING TO THE POOL SHORTLY---YIPPEE FOR ANOTHER ORANGE FAN! I think you're right, Lecates. I'm thinking those berries will arrive this Fall. No, in spite of this plant's name, it's not related to a real cranberry bush. Don't know how or why my new bush got its name. I'd have to do more research on it. I'll take a picture of it soon to show you all. COVEGIRL, SOUNDS LIKE A WONDERFUL WAY TO SPEND THE DAY. HOW WAS IT? PAULA, POSSIBLY THE BERRIES WILL FORM AS THE WEATHER GETS COOLER SINCE THEY LAST DURING THE WINTER---THE COLORS OF THE LEAVES SHOULD BE LOVELY---BUT IS IT RELATED TO REAL CRANBERRIES? THINKING THEY GROW IN WATER? I did get some compost down in some of the beds. I will probably try to do some more before the end of the growing season. 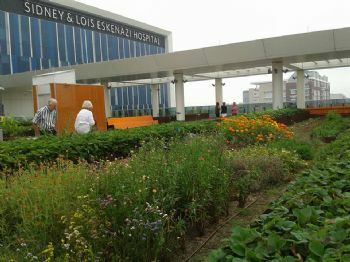 Today, I am visiting the sky garden on the roof of Eskenazi Hospital in Indy with my master gardener association members. 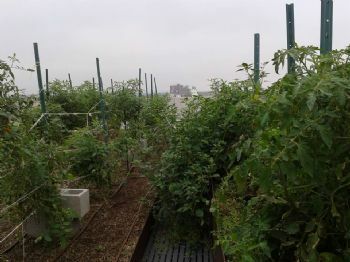 We will also visit the Medicinal garden and another urban garden. Oooo, Nancy, new curtains! They can make all the difference in a room. Covegirl, how did the composting project go? Lecates, I love orange flowers too. This year I planted orange dazzle impatiens & flame orange geraniums in the flower gardens that surround the front and eastside of my home. They surround my vanilla marigolds. I've never had such a batch of robust marigolds as this year's. They're over 2 feet tall! They like Miracle Gro. This past Spring, my granddaughter gave me a Highbush Cranberry plant that I put near my hydrangeas next to our property line. Have any of you had experience with this kind of plant? It's to grow up to 12 feet and its leaves will turn from red to purple in the Fall. Right now they are maple leaf green. It suppose to grow "showy flat clusters of white flowers", followed by large bright red berries that will provide food for the birds throughout Winter. My plant doesn't have any flowers yet. Azure butterflies are suppose to love this kind of plant. I can see how well butterflies like my marigolds....there's always LOTS of butterflies on them. YOUR PLANTS WILL LOVE YOU! i hope to dig out and spread some compost, today. Time To Trim Your Monkey!